Editor’s Note: Since this article was first written around the end of 2001, a grassroots network of thousands of people has grown who are using and developing this powerful technology in a number of ways to convert the negative energies that we are being subjected to, into positive ones. Many thanks to genius inventor Don Croft. ORGANITE: This is the new word for the basis of Don’s creation. It’s a mixture of metal filings (in-organic substance) and resin (organic substance) and a crystal. It converts negative orgone energy to positive orgone energy. To be effective over a period of time, it needs to be in earth or running water to cleanse itself of the negative energies it collects. This CB was made by Gert Botha, of Namibia, Africa, from scavenged materials, so the result is slightly modified from the instructions. 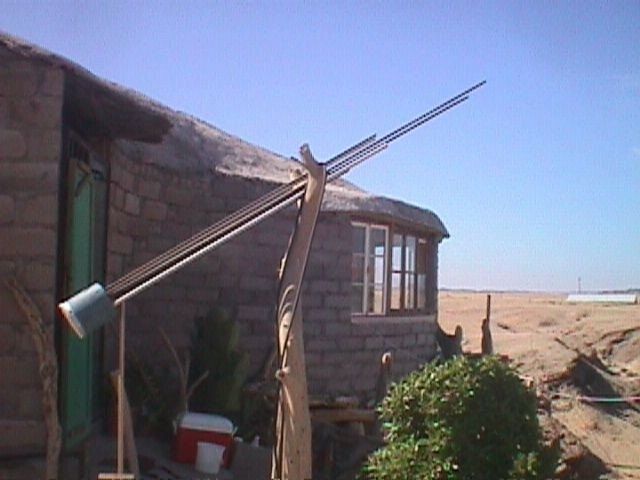 This cloudbuster was used in Africa’s Namib Desert and brought several days of continuous thunderstorms after a 12- year drought. Definition of a contrail: A contrail occurs when a plane travels at a high altitude (about 30,000 ft. or more) and compresses the air into a water vapor or ice crystals through jet engines or the wing tips pushing through the air. This trail disappears after a minute or so due to evaporation, because it’s water. Definition of a chemtrail: The term "chemtrail" is a relatively new word, which appeared in the last few years along with the appearance of chemtrails. A chemtrail is very different from a contrail. At first a chemtrail might look a bit like a contrail. However, instead of disappearing like a contrail does, a chemtrail just keeps spreading out and forming a hazy cloud bank. These trails traverse the whole sky and stay for up to around five or even eight hours. They have been known to turn what was originally a clear blue sky into a grey haze. (Note: As of Nov 2001 there are already at least several dozen cloudbusters in seven countries, so if you see chemtrails that don’t last anywhere near this long, there may already be a cloudbuster in the area). It is believed chemtrails are composed at least in part by an oil based substance of unknown content that is actually being sprayed from jets on populated areas. It has also been found that some chemtrails contain unknown biological components. There are many reports of increased diseases, especially lung diseases, in areas where there are chemtrails. Chemtrails are often seen to be sprayed by white planes with no markings. Sometimes you will see these planes give off no contrail at all, and immediately after the same kind of plane in the same area will start to leave a thick chemtrail. At other times, distinct short gaps in chemtrails have been photographed, as though the plane ran out of chemicals and then had to start spraying with a new supply (as in the photo). The Wilhelm Reich cloudbuster (CB) was well known for its ability to create rain. But a problem existed with its continued use, in that the deadly orgone energy that it absorbed could in fact hurt the operator if it was not correctly "drained off". This "draining off" of deadly orgone energy was accomplished by 1. Connecting the cloudbuster to a body of running water (difficult) or 2. Connecting the cloudbuster output to an orgone accumulator. However, the orgone accumulator would soon become saturated with the deadly orgone energy which in turn caused more problems for the operator. So the cloudbuster, as good a technology as it is, has lain dormant for many years only being used by such professional weather engineers as Trevor James Constable, among others. Don Croft, a patriot, alternative scientist, researcher, inventor and freedom fighter has succeeded in striking the first blow against the ongoing chemtrails program that is assisting in the destruction of our country and the enslavement of its citizens! . By utilizing the research of Wilhelm Reich, assisted by his partner Carol and having help from God almighty, Don has created a cheap, portable and easy to build device that consistently destroys Chemtrails and heals the atmosphere. The Reich/Croft " chembuster" is the answer to these ongoing attacks by the forces of darkness. 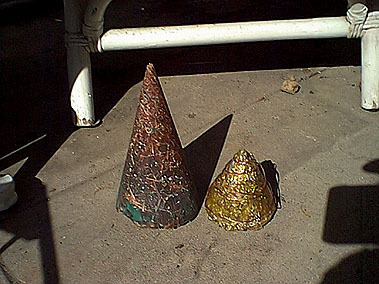 Unlike the original cloudbuster, the chembuster actually changes the deadly orgone energy to good orgone energy and so does NOT become saturated or dangerous to the operator. Join The Battle – Now ! It is human nature to sit on the sidelines and think that one person cannot change the things that are happening to our country. You now have no excuse for inaction. For the cost of a few dollars and a few hours of your time YOU can make a difference. With this device a mere few thousand patriots can SHUT DOWN the multi-billion dollar chemtrail program. The Reich/Croft chembuster cannot do any damage. It can only help and heal. Its up to you to join the fight to save America. Don is using Orgone energy, which was the name given to ch’i, ether, life force, etc., Dr Wilhelm Reich. He does this out of respect and gratitude for Reich’s life’s work and sacrifice. Carol and I got these specs by dowsing, and they work very, very well, though may not be the last word, if you get my drift. Let us know at ‘; document.write( ‘‘ ); document.write( addy_text5009 ); document.write( ‘<\/a>’ ); //–>\n if you can successfully modify it. BUCKET: Base: 9" in dia., 9" deep. I use two-gallon plastic buckets from the Home Depot paint department, but two-gallon food buckets, available from restaurants, or two-gallon spackle buckets from drywall contractors are fine. I leave the buckets on, as the handles make it easier to move the finished cloudbuster. to buy as much copper pipe this way, too. CRYSTALS: I glued a double-terminated quartz crystal, about 2" long, into a .75” section of garden hose, and one of these devices is glued in turn inside each of the six copper end caps, pointing in the same direction as the pipe will be after the cap is glued on. I use ‘Goop’ glue. I taped around the cap where it joined the pipe to prevent resin from leaking into the cap during casting. aren’t quite as good as ones that will easily go through a window screen & slightly bigger ones are okay. There really is a wide margin of suitability! . PLYWOOD: Template 1 – 3/4” exterior plywood is used to make the base for the copper endcaps/pipes. I arrange the six pipes evenly around a 2 1/2” radius circle, which makes the pipes 2 1/2” apart on centers. A flat, 1 1/4” auger bit drills a suitable hole for each end cap. Template 2 – Make another piece to fit inside the rim of the bucket. Remember to cut a section away so you can fit your fingers under it to remove it from the bucket. This piece is not part of the finished CB, just used to get the spacing for the pipes right during construction. Cut the holes in this with a 1 1/8” flat bit so that it will fit well over the six pipes. This piece will hold the pipes in position while the second batch of resin hardens. RESIN: I use polyester resin (used to build fiberglass boats) but epoxy also works, as does envirotech resin from www.eti-usa.com (this sets up very quickly, so you need to be proficient with it). (If you are going to construct many of these units, try to purchase your resin in 5 gallon buckets over the internet, possibly from a surfboard or boat manufacturing supply company. ACE hardware for $12.95 per gallon. Home depot gets $24 per gallon for resin. On a level surface, pour an inch or so of catalyzed resin into the bottom of the bucket and stir in metal particles until the surface is uniform and flat. The ratio that seems to work is approx. one part resin to one part metal particles. Put the base wood Template 1 onto that before it hardens, so that it just touches the surface and doesn’t sink in much. Pour a half gallon of catalyzed resin into the bucket after the six pipes are set into the holes in the base template. Use the dowel to stir in handfuls of metal particles in the same ratio as before. Note that the wood Template 1 should not be pushed down to the bottom of the bucket with the resin squishing over the top. Expeditiously move the Template 2 down on to the six pipes until it is snugly within the rim of the bucket. Put the top Template 3 onto the top of the pipes and move them until the pipes are parallel. After the resin has hardened, remove the second template and set it aside. This is only used during construction, as I mentioned. Cut six pipes, 12" long, and put the crystals/endcaps on them for the base. Buy six joints which allow a pipe to come into them from both directions and stop at the middle. This allows you to make the rest of the pipe assembly from three pipes, 10′ long, cut in half. The finished product leaves you with only one piece of pipe, four feet long leftover. When positioning the 12" pipes for pouring the second layer of mix, temporarily tape the top ends of the 12" pipes so no metal particles are dropped in them by mistake. After the mix is made, take off the tape and push the rim plywood piece down onto the pipes so that it fits into the rim of the bucket. Put the spacers, then the 5′ pipes onto the 12"base pipes, then put the third (top) plywood piece onto the tips. The pipes will look skewed, most likely, so just twist the top plywood piece around until the pipes line up parallel. As you do that, the rim plywood piece will move around. You need to do this expeditiously, though not in a hurry, so that the resin doesn’t harden before you’re done. We experimented with 5′ extensions to the pipes to increase the range. It had a strong effect on the moon and on the upper atmosphere of the planet for hundreds of miles. We also apparently shut down the weather warfare facility under Homestead Air Force Base while we were in the Keys by leaving the extended cloudbuster pointing at the dead orgone field above it for a week. We found that we don’t need to point it in any particular direction in order to clear the atmosphere of bad orgone, and the longer it’s left standing, the nicer it feels for a longer distance from the cloudbuster (many miles). We just stand it on its bottom, pointing straight up. We did once eliminate a belt of smog which was just off the coast by aiming at it for a few minutes, so direction can be a factor. We also severely alarmed the operators of a ufo that was in the vicinity. It instantaneously shot out into space, where it remained in the same position relative to us, so the basic 6′ long pipe configuration apparently only affects the atmosphere. Do be discriminating which UFO’s you aim at, though. If they are not predatory and you make them mad, they may pay you back by messing with your carburetor or something, as they did to us once. The really advanced ones are not susceptible to the cloudbuster, as they apparently don’t need a deadly orgone field to operate. Our take is that all but these use nuclear fusion or some other noxious, old-paradigm energy source. It’s open season on the B Sirian craft and other predatory ones, as far as we’re concerned. They can’t hurt you, by the way, if you aren’t afraid of them. Universal law restricts them more than it does us. We can pay later for breaking it, but they are just unable to break it, apparently. Cloudbusters destroy chemtrails consistently. It may take a few days for your cloudbuster to activate the environment enough to do this, but after that point the spew will disappear within seconds of leaving the UN jets and dissipated trails that drift within range of the cloudbuster will also disperse, but more slowly. The ones that are made up of solids take longer to dissipate, but we’ve found that these only make up about 10% or so of the spewing episodes. The evil intent of the UN is most apparent to me in the fact that Lucis Trust (formerly Lucifer Trust) publishes all of its official literature and dictates its philosophy. Only this belief system, which closely resembles the doctrine of the Nazi party, could condone the rampant genocide which is now being carried out by the UN. Dr. Reich’s cloudbusters were extremely dangerous when in operation since he had no orgone generator attached to them. Bad orgone does carry a charge which can quickly drain one’s life force away when it’s concentrated in one spot. It’s slightly similar to a strong positively charges static electrical field. When cloudcover is unproductive or unbalanced (too much lightning, for instance, or too much rain) the cloudbuster busts it up. We plowed a furrow through a line of artificially created thunderstorm in June, 2001. Carol said the square-shaped thunderheads were chock full of predatory ET’s, bent on mutilating animals at the time. It also stops droughts. Overall, it just balances the weather, I think it sort of mediates between the ground and the atmosphere somehow. The one in Namibia finally brought heavy rain to the desert there. It happened 9/5/01, and continued for several days. Gert, the fellow who made the cloudbuster and reported the occurrence, told me that this had simply never happened in the Namib desert before to the best of anyone’s knowledge. It’s arguably the driest region on the planet. WARNING: If you touch the pipes when they’re drawing in strong unbalanced or dead orgone and don’t put your hand on the base after that, you may experience headaches, even into the next day, as a friend of ours did recently. Mind you that our efforts, though somewhat pioneering, should be seen mainly as a springboard for further developments rather than the last word. Somebody’s starting a list for cloudbuster aficionados shortly. SUGGESTION: If you want even more rain, try putting water on top of the material in the bucket and/or hosing down the whole apparatus daily. The HHG (Holy Hand Grenade) is a small orgone generator that will correct imbalances in energy fields. If you want to clear out the unpleasant entities from your immediate environment, expel parasitic/predatory ET’s from your auric field, neutralize the energetic effects of chemtrails, etc., just make one or more of these and put it on the ground or in your house, according to your intuitive promptings. My partner, Carol, and I have found ! them very effective for minimizing the deadly orgone fields around nuke plants, even the ones built on natural vortices (sick puppies did that intentionally). They also heal and strengthen all natural vortices and man-made ones, like the Caribbean Blue Holes. Life doesn’t have to be difficult and years of training and discipline are no longer necessary if you want to do big magic, to which I can bear witness. In the new (present) paradigm one’s character and intention count more than training and institutional acclaim. If you can dowse with a pendulum or rods, etc., that may be the best way to find the right spot to put a HHG. It’s especially effective when placed on a ley line and especially on the junction of two or more of these, but this isn’t necessary. Every room and building has its own dynamics, so you could dowse for the correct spot based on that. If your house is built on one of these leyline junctions, though, lucky you! More often than not these days the vortices produced by these nodes are distorted and even backward-spinning. The HHG very quickly heals and redirects these on its own. You don’t need to do anything else (don’t hate me because I’ve given you an easy, inclusive way to do this ;-). If you’re a weird science guru or wannabe you’re probably not reading this anyway). Most of us just want to have a nice feeling in the house and immediate vicinity. You can put a HHG anywhere for this. sign that something is being done to violate/destabilize that part of the planet. It’s so easy to turn that around with a HHG and/or a cloudbuster (let me know if you need cloudbuster directions).Zapper16@earthlink.netZapper16@earthlink.net. 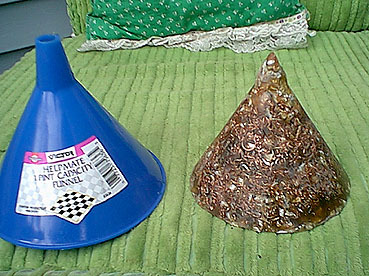 A plastic funnel or cardboard party hat (tape the seam so the resin doesn’t leak out) To form a point at the end of the funnel, saw off the spout and form a point with 2” wide masking tape, being sure to prevent leaks. The funnel will allow you to make several from this mold. Party hats are better if you just want to make one. When I make them with party hats, I leave the hats on the finished HHg. A couple of cups of aluminum particles (OR a pint of BB’s). I use aluminum from the crosscut saws in shops that use extruded aluminum a lot, such as large sign shops, fabrication plants, etc. Some plastic and/or wood in the sweepings is fine. I pick out the cigarette butts for aesthetic considerations 😉 Larger towns and cities have recycling businesses that have the aluminum particles in large bins, which they sell cheaply. A quart of polyester resin or epoxy resin (this will encourage you to make at least two 😉 More politically correct resin is available from Envirotech, at www.eti.com. happen, myself. One of mine did turn clear when I went to the Bahamas. I’m pretty sure the Atlantean energy at the Mars Bay blue hole did that. The plastic funnel needs to be big enough to make a 4” high cone. The bigger the cone, the more powerful the HHG. I encourage you to experiment with different configurations. Let me know what you find out, please, since you’ll likely surpass my own efforts thus far. We made one 7” high for the vortex at the secret underground base near San Diego from which a few investigators never returned. We deployed that one on 6/16/01. Boy, are they mad at us! We’d never been surveilled so much before that day. Set the funnel, point down, in a can or jar. Put some aluminum particles or BB’s in the bottom, enough to make the vertical crystal stand on its own. I put the better defined end of the double terminated crystal toward the point of the cone. Pour some resin on top of that and let it soak down through the metal particles. Put enough aluminum particles or BB’s to cover the rest of the vertical crystal and pour enough resin in to cover that. Place the other four double terminated crystals horizontally, aligned 90 degrees apart so that the four compass directions will be covered when you’re ready to deploy the HHG. Make a mark on the funnel to indicate where the point of one of the bottom four crystals is if you want. This is marginally important. I never do that, myself. Cover the four crystals with aluminum particles or BB’s and cover that with resin. At this point, make the funnel level, either visually or with a spirit level (the ruler with the bubble thing built into it). You don’t need to get it perfect, but perfect is a little better than not. I never fill it to the edge of the funnel, since this makes it harder to finish off and is pretty messy. If you want to make a really big one, make a paper cone (taping the seam) out of a big piece of thin poster board and tape that into a large funnel. We’ll be putting a big one in the reservoir in San Diego [done, June 01] and at the huge vortex southeast of Bimini soon. Those vortices are particularly big and distorted for some reason. Remember that lining up with the compass points is not critical. I put small parachutes on the ones I use in deep water locations so that they’ll be upright when they reach bottom. Make a mark on the flat part of the hardened material now so you’ll know how the four bottom crystals are aligned, since you can’t see them any more. Take the now-usable but crude HHG out of the funnel now and file the material at the little end down to create a point on the cone. I use a rough belt on my belt sander for this, but feel free to do it the hard way. You can file the edges of the bottom a little if you don’t want to cut yourself with it later. Having made the mark on the bottom, you can line it up to the compass wherever you put it. Put another mark near the bottom of the cone surface to make this easier 😉 This is optional, as it works fine if not lined up with the compass, too. You can make it a little better by getting fancy crystals if you want. You can probably improve it in other ways, in which case, please inform me at zapper16@earthlink.netzapper16@earthlink.net. I won’t make these for money but feel free to do so yourself. I’ve capitalized this way on the pioneering work of other people. at www.spiritherbs.com, who is also a Wingmakers aficionado. IMPORTANT UPDATE March 15 2003: The cloudbuster and HHGs need to be in touch with the ground to be most effective. If you cannot place them on the ground, connect them to the ground with copper wire. Do all of the above in a smaller funnel . The resulting cone should be under 2” or so, simply because this is easier to use. You’ll need non-ferrous metal, preferably aluminum because it’s easier to tool. Instead of quartz, get an amethyst gemstone for the top and a garnet gemstone for the bottom, center (we use 9mm amethysts and 6mm garnets). In between, put a strong neodymium magnet. North side down is customary, but when a single magnet is used, we’ve found that it doesn’t matter which pole is toward the body. This is true only when an array is used which causes one pole to be dominant in the field. Be sure to get some aluminum material around the magnet before pouring more resin in so it doesn’t jump toward the can holding the funnel. BB’s aren’t appropriate for this, since they’ll just ball up around the magnet and drive you berserk. You need to allow enough space in the pointy end to round off the point to about a half inch diameter without assaulting the amethyst during the rounding process. I use a belt sander to round off the top but you can do it with a file or a rough rock if you’re a Luddite. Rounding the top makes it better than the big HHG for directing energy through the bottom into the human body, especially at chakras. This one is fun to wear over the crown chakra or sixth chakra. A new meaning for the term,‘party hat.’ It does seriously get rid of pain and will speed healing to any part of the body. It also prevents nightmares and promotes lucid dreaming and meditation. When I’m meditating, some accuse me of sleeping. The occasional snoring is done just to jerk them around – self righteous twits! If you want to put a copper, cone-shaped spiral in this one, contact me for further instructions (thanks, Linda!). Thanks a lot for the account of your farmer neighbor, Ber. I saw recently that ALL of the madrone and myrtle trees along I-5 in Oregon are dead now. I saw a bright green fungus on all of the deciduous trees in that area during the winter of 99-00, which I attributed at that time to the mycoplasma of the ever-present chemtrails. I read that nearly all of the foals born in Kentucky this year were DOA and/or malformed. Here’s our take on how the cloudbuster works, and also how the UN chemtrails, HAARP, and electronic mind control are able to function. It all has to do with non-electromagnetic energy in the form of deadly and/or dead orgone. I use Dr. Reich’s terms for this energy, since he’s the only scientist who has done extensive research with it. I used to make orgone accumulators. I made them in many shapes and sizes and recognized the benefits and advantages from the beginning. The only drawback to these is that they absorb harmful orgone as readily as they do healthy orgone. Orgone is omnipresent. It’s ether, life force, prana, ch’i, etc., and makes up the energy and matter potential in all of creation. In its balanced state it promotes life, growth, equilibrium, but in its unbalanced state (deadly orgone is overactive orgone, dead orgone is, well, DEAD) it has exactly the opposite effect. When you see smog, you’re seeing dead orgone in which particulate matter is suspended, sort of like a colloid. Very strong wind, tornadoes, hurricanes, cloudcover which yields no rain, drought, are all manifestations of harmful orgone. In order for any parasitic activity to take place, an energy field needs to first be developed. Parasites do that in the body by excreting acids into their immediate environment. Infections, chronic pain, and a host of symptoms are manifestations of the activity of these parasites. Healthy orgone results when the polarity of the parasites’ environment is reversed from positive (acidic) to negative (slightly alkaline) by the introduction of weak electric current through the skin. This is the business we’re currently engaged in, so we get plenty of data and confirmation regarding this process. In the atmosphere, agents of the present day order create massive fields of unbalanced orgone energy by introducing very powerful, specific frequencies of radio waves, spraying large volumes of acidic petrochemicals above the clouds, and by other, less believable means. Enter the orgone generator. My frustration with the orgone accumulator’s fickle behavior was answered three years ago, when one of my customers directed my attention to http://www.orgone.net he was actually experiencing some frustration, since he paid $500 for $5 worth of epoxy and metal particles, and apparently nothing else. My daughter, Nora, was living with me then. She sees energy the way my new wife does (we’ve been together a little over a year) so as soon as I put the two materials together, she confirmed that it was, indeed putting out a very strong, constant field of healthy blue orgone. Adding crystals and copper pipes made it possible for me to direct the energy and alter the characteristics of the field. One of my first thoughts was that I could create a cloudbuster that didn’t need to be connected to running water, or any water, for that matter, as Dr. Reich’s needed to be, and I could set it up to aim at city hall in the town I was living in, Ashland, Oregon. Theyr’e as crooked as any other local government, so I expected to get some good, observable results. It was some time before I got around to making a cloudbuster, though. Nora could see energy, but I needed some input from somebody older than twelve. A little over a year ago, Carol and I started working together. We began experimenting with small orgone generators, mostly around natural vortices, which Carol is able to see. Every one we’ve ever encountered since, except the one the Navajos nurture at Four Corners, has been distorted and misdirected by the present day order. In each case, putting an orgone generator within the vortex brought it back to vibrant health and balance, sometimes instantaneously, other times, as at the Federal Reserve Bank of New York, and at the secret facilities under Montauk, NY, over a period of hours and even days, depending on the nature of the activities carried out within the vortices previously… We developed the Holy Hand Grenade (HHG) during this time, which is a cone shaped orgone generator, 5” or so high, with a vertical crystal inside near the point and four horizontal crystals arrayed within the bottom surface. We’ve put these in vortices along the east coast of the US and across the country to the west coast, in Canada and the Bahamas. We’re just getting started. Some intrepid Canadians are about to put one each at the Vatican and Assisi. I’m recommending that people put one at every major masonic temple in the world, since any time you put one in a focal point of error, the whole region gets the benefit and the people of error get deprived of the earth energy they had been abusing. I wrote a full account of our activities over several months, which anyone can have if they email me. It’s also being published serial fashion in Open Line, a monthly metaphysical newspaper. There’s no physics like metaphysics, after all. In late March, this year, we had planned to make a sort of pilgrimage to Orgonon, Wilhelm Reich’s home and lab in Maine. I set it up at our site in the RV campground in Ft Pierce, Florida for several hours while we packed, then took it apart and put it in the car. I didn’t assemble it again for another week, when we arrived in Maine. We looked at the weather channel in the motel, and noticed that the whole state of Florida was still experiencing a drought, but there was a circle of heavy rainfall for a twenty mile or so radius around Ft. Pierce. Here’s how we think it works–when metal particles are put in an organic matrix, orgone is apparently generated instead of just accumulated. I don’t know why. When unbalanced orgone is present, it’s drawn into the orgone generating material and transmuted into healthy orgone. I don’t have a clue how this happens, either. Making an orgone generator in a two gallon bucket and sticking copper pipes straight up out of it draws harmful orgone into the generator from many miles around and it goes out as healthy orgone in all directions, though Carol sees it happening in a sort of lens shape, parallel to the ground more or less, then moving up into the atmosphere. This gradual effect may explain why it sometimes takes a cloudbuster up to a week to get enough good stuff up to the 20,000′ + altitude to disappear the chemtrails. The average radius for effective chemtrail destruction by a cloudbuster seems to be about thirty miles. Good weather effects extend a great deal farther. The rest of the region has had a drought, but the area around Spokane has been getting rain every week or so all summer. As we drive along I-90 toward Settle, there’s a lot of new green growth and flowers all summer long until we reach the Columbia Gorge, 150 miles west. Anyone who lives here can tell you that this is not characteristic of the semi-desert environment west of Spokane. We have concluded that it takes three things to make any macroparasitic/predatory activity to succeed: A field of unbalanced orgone, technology of some sort, and an operator who directs his/her intention through both. Just as fire requires three things, oxygen, heat and fuel, and removing any one of these stops the fire, removing any of the components of parasitic/predatory activity stops that process cold. We’re focusing on removing the harmful orgone medium, which puts us squarely on the side of universal law. No need to go into the other-than-human entities’ involvement here, though it does add another dimension, so to speak. Parasites are as parasites do, after all. Most people are not parasitic or predatory, so by simply neutralizing the effects of those who are by removing their harmful energies, the whole planet will come up a notch or two in awareness, freedom, etc. Another benefit of a healthy, strong orgone field is that fear and anger become diminished, and whatever diminishes fear increases courage; whatever diminishes anger increases love and acceptance.. There are two cloudbusters in Spokane this summer. Now that the smog is gone and the orgone level has increased, the whole ambiance of the city has improved. I personally used to dread having to go there, but now, after a whole day in the city (including traffic) I arrive back home feeling refreshed and relaxed. I had once vowed that I would never again spend the night in any US city because I was so badly affected by the concentration of harmful orgone found in all cities. This really is what magic is all about. The possibilities are limitless. I’ve been encouraging people to build holy hand grenades for their homes, too. I’ve gotten several unsolicited reports from people who did that which said that they no longer had trouble being in the presence of the overbearing in-laws and others who came to visit them. This needs to be experienced to be appreciated, I think. This is not the same as Dr. Reich’s original cloudbuster. The only resemblance is the use of pipes. The former could cause changes in the atmosphere by drawing the unbalanced orgone out of the targeted area and putting it into flowing water. This one apparently draws in the unbalanced orgone, revitalizes it as balanced orgone, and sends it right back out into the atmosphere. Don’t expect the same results as Dr. Reich and others have gotten, but do expect the elimination of chemtrails, the elimination or reduction in smog and general malaise over a very wide area. It’s not necessary to point this model to remove the chemtrails. It will do that for up to a fifty mile radius if it’s just left standing in the garden or on the deck. The base is a large orgone generator, not an accumulator, and has very different characteristics from an accumulator, one of which is that it apparently can’t be polluted by unbalanced orgone fields, even when they’re produced by a nuclear reactor. This is why we feel confident to share this with anyone. The production of balanced orgone increases in direct proportion to the strength of the unbalanced field. Carol and I got these specs by dowsing, and they work very, very well, though may not be the last word, if you get my drift. Let us know at ‘; document.write( ‘‘ ); document.write( addy_text35597 ); document.write( ‘<\/a>’ ); //–>\n if you can successfully modify it. Carol and I have been engaged in a project to (1) balance some earth energies, (2) provide a reliable cure for, among other things, the rather serious illnesses (now endemic) resulting from the chemtrail program (our cloudbusters also get rid of the chemtrails and cancel weather warfare effects), (3) interact in a productive way with ET’s and native non-homo sapiens sentient races who have been doing business on, in and around our planet, outside of the awareness of! most people. We sincerely believe that what I’ve been writing about is true. I can’t guarantee that any of it is true, though, and no doubt some of it is colored by our own limited understanding and perception. the media to true journalism is on hold for the time being. The Internet is, we believe, a manifestation of the emerging awareness that is causing the disintegration of the institutions and political modus operendi of the alleged order mentioned above. It’s the only bastion for free speech and every effort to control and regulate it by these redundant planetary institutions has failed. Our contention is that the Internet itself is giving birth to a more appropriate world commonwealth and that simply discussing this principle by email is speeding up the organic process that will bring it to full fruition. There is no need, nor is it possible, to control this process. The impetus for writing was our own feeling that we could be risking our own safety by pursuing these subjects, a feeling that has been justified historically by the alleged order’s persecution and even murder of people who have pursued similar paths. Our instincts tell us that there is inherent protection in notoriety, as the alleged order is afraid of nothing but the collective awakening of humanity and the exposure of their own misdeeds. Since the circulation of our stories by Al McClain, Russ Michael, Sue Potter and others (thank you very much!) we’ve felt a considerable reduction in hostile attention by the alleged authorities, many of whom are still people of conscience at any rate, however misplaced their loyalty may be. our astonishment in both cases. I use these as examples only. cards to interpret synchronous processes. I met her when I traded an orgone accumulator for a Cards of Destiny reading years ago. I knew at that time that orgone devices increase psychic perception. Carol’s a Jack of Clubs, by the way, and I’m an Ace of Spades. Both of us feel that service to humanity is more important than self-advancement, though we also believe that any work deserves compensation in some form. We’ve been paying for our “research” and for sharing information about the holy hand grenades and cloudbuster by selling Terminators, our only product. The long term reward for sharing these devices, though will be attained when the true World Commonwealth that is foretold by every prophet and seer in human history, has supplanted the parasitic shadow order that currently operates our economies, governments, educational institutions, agriculture, medical/drug cartel, etc. Under the mandate of the emerging order, these will all be decentralized and more efficiently and fairly administered at the local level. This is not new or unexperienced. There are many cultures, especially in less centralized nations, which have been organized this way for thousands of years. There are plenty of pitfalls and lots of trickery aimed at diverting us from investigating reality. The only defense is to be detached from the process and look for the overview and the unifying principle patterns that indicate the signature of the new paradigm and the underlying unity of the human race. For instance, we now tend to turn away from whatever uses secrecy, elitism, complexity, hedonism, and exploitation. What is true doesn’t need to be protected any more and no individual has the right or responsibility to tell others what to believe. The new paradigm allows us all to find our own level and fakers are no longer able to deceive people who are basically aware of the parameters of the new paradigm. Happily, there aren’t many professional obfuscators now, at least in the metaphysical community. The bottom seems to have dropped out of the obfuscator market now that a critical mass of ‘knowers’ has been reached, and knowledge has ceased to be institutional property. Gregg Braden had written that a study was done on what portion of any population actually determines the course of the progress for the rest. They came up with this figure: the square root of 2%, which amounts to a few thousand in the US. I don’t remember the rest of it, but I have the impression that these few thousand are not generally the experts who are on the payrolls of institutions, and some live in Beverly Hills; some live in Harlem and rural Alabama. The real pioneers now are mostly online and correspond with each other and most are self-financed. This is a sharp departure from the former paradigm in which Nicola Tesla, Wilhelm Reich, and many others needed the support and/or approval of the alleged governments and monetary establishment to do their work. There’s something to contemplate. We’re on the threshold of having free energy. I personally know one of the inventors and he is aware that there are many, many different technologies that provide free energy now, most of which can be marketed. We hope to be the first ones to actively promote a demonstrable free energy device, the Joe Cell. If someone else beats us to it, that’s fine, too. I think we can demonstrate that it’s now safe to promote these things. I’ve been openly promoting the benefits of the zapper on the Internet for years and haven’t been harassed by the alleged gov’t, though, according to their rules, I’m breaking any number of alleged laws. I’ve made it clear that opposition by these unlawful agencies is an endorsement, so I’m not hiding from them. The ‘law of rules’ is not and will never be the rule of law. We will continue to trust in our intuition and divine providence for personal protection and instruction, as anyone can. Rules are made to be broken, which is why everyone ‘cheats’ on taxes. Integrity dictates that if one participates in any system, one should abide by the rules or get out of the system. I paid off my bank debts and sent their SSN number back to them over five years ago. I simply couldn’t bear to be considered the chattel of the Federal Reserve Corporation any longer, as anyone who uses an SSN is, de facto, despite the Constitutions clear opposition to those disgusting practices. Getting approval from the alleged gov’t for innovative devices and procedures is no longer necessary, we feel, and is even counterproductive. There are real laws on the books that cover fraud and other treacheries. We don’t need the Uniform Commercial Code to regulate our personal lives. Pretty soon the UCC will be seen as an unfortunate lapse into tyranny that lasted from 1935 to around the year 2,000, after which a world commonwealth was gradually established based on the freedom and responsibility of the individual, as the American Republic had been. We simply believe it’s no longer necessary to wait to exercise these birthrights, and there are entities and supernormal agencies that want us to succeed and are protecting us. Why would anyone believe something and not be willing to take risks for it? Naturally, when one makes this commitment, it’s understood that he/she will persevere alone, if necessary, and until one’s last breath. The brainwashing of the baby boomers has dictated that this is unfashionable and even unbalanced, but happily the children of this generation feel otherwise, as they have shown by opposing the alleged world order itself. don’t really need to institutionalize spirituality or science any more. I do think professional obfuscators and tyrannical agencies are fair game, though. NOTE: The cloudbuster is synergistic with Slim Spurling’s Harmonizer. Please save this article and photos on your own computer, in case this site ever goes down. They are going totally nuts in Los Angeles today (late March 2002). We’re talking chemtrails over a hundred miles long going from one end of the city to the other. I wish I had a wide angle lens so I could illustrate just how effective these CBs are. There is as I type a clear area maybe 30 miles across directly over my house. They have been pounding the same area all day and nothing has stuck. Unfortunately, I can’t say the same for the areas of the city not protected. At least 50-75 trails have merged into a huge purple/brown mass to the East. I really feel for anyone under this canopy. They are going all out, obviously in desperation. P.S. I would like to thank the pilots of the black helicopter that buzzed my house last night at about 100′ and the several that have made passes directly over my house at low altitude today. Your validation of the effectiveness of my CB is very heartwarming. Soon you’ll have a lot more to keep track of. "When we observed chemtrails overhead we directed the cloudbuster at them and saw them breakup. The same was repeated the following day. I am now in the same position using the cloudbuster as I was three years ago when I first stated using Slim Spurlings "Harmonizer". Too many coincidences. This simple technology is affecting our environment in a very positive manner. It is truly grass roots and I feel blessed to be a part of it." I witnessed Don`s cloudbuster in action in Seattle this past summer and was impressed with the speed of response. Fred Fischl did the demo and noted that the response was much faster than he had previously observed, due to the fact that we had a Harmonizer field running at the time in close proximity. I have built and used several cloudbusters similar in principle to Reich`s starting in 1974, with universally good results. Don`s innovation on the technology is a superb simplification which makes it easily available to all and may have some very far reaching benefits in the immediate future as we contemplate chemical and bio terrorism from many sources. I believe that the nuclear terrorism has had its fangs pulled due to the many Harmonizer units currently in the field in the major population centers. However more are needed in the country to strengthen the overall field. Neither Don Croft or the webmaster of this site, Stephanie Relfe, receive any money from the sale of Michelle’s products. Please join if you intend to have a cloudbuster!!! 1)http://groups.yahoo.com/group/cloudbusters/. However, that group got hacked too often by a number of parties, including we presume operatives for the secret government. NEW! The Tower Buster! Negative mind-controlling energies sent from cell phone towers can be reduced with Don’ s new Tower Buster! Don believes making Tower Busters is currently more important than making Chembusters! This entry was posted in Activisim.